If you’d like to contact us about getting stained concrete floors for your business, please call 301-261-4933 for a FREE estimate, or click the button below. Please note that we only serve commercial enterprises, and do not do residential work. Stained concrete floors are a creative and budget-friendly option to give your company’s appearance a boost. There are many reasons to select this flooring option, which include the following. There are nearly unlimited options for staining concrete floors. Colors can be added to the concrete mixture itself or acid stains and paint can be applied to pre-existing concrete floors. This means that you can get the right color flooring to match your business’ decor, or even use your company colors to keep your color palette consistent. Colored concrete can take on dozens of different shades, and the finished product can have subtle variations thanks to the aggregate materials in the mix. When the color is added to liquid concrete, it’s easily controlled and more consistent throughout the mix. Pigment colors have varying prices, as some hues are more difficult to find than others. But a custom business front that welcomes guests is a truly priceless addition. Acid stains give concrete a marbled look without the hefty marble price tag. The acid is administered after the concrete slab is set. Resulting colors and patterns will depend on the type of acid used, and the amount of time the acid was left on the surface. Acid stained concrete floors do not have a uniform appearance, which is similar to the natural appearance of marble. Finally, paint can be used to add color to concrete floors. Before the paint can be applied, any gaps or cracks in the concrete must be filled. Once primer has been applied and has dried, painting can begin. Latex or epoxy paints are often used for this purpose. Once the floor has dried, a sealer is poured on top to protect the color that helps prevent chips, scratches and other damage. For a highly polished appearance, a clear coat for concrete floors is available. Concrete floor stain costs are dependent on the size of the space to be stained, the method used for staining, and the color selected. Concrete stained floors cost more as the number of colors and details increases. As a general reference, Concrete Network estimates basic and mid-level stains cost between $2.50-$5.50 and between $5.50-$7.50 per square foot, respectively. This puts concrete floors on par with linoleum, ceramic tile, vinyl, and carpet flooring with regard to costs, making them a stylish and economical option. Since concrete can last for several decades and often does not have additional replacement or repair costs, it is indeed one of the most affordable flooring solutions. An additional benefit of stained concrete floors is that they are easy to maintain. The best way to clean stained concrete floors includes a few important steps. Dust and dirt are the main enemies of stained concrete floors. As a result, they require daily dust mopping to reduce this debris and prevent scratches. By keeping your business in a dust-free state, you both impress your customers and extend the lifespan of your concrete floors. Stained concrete floors also need to be mopped on a regular basis, preferably weekly. They must be mopped with a neutral pH cleaner so the protective seal is not eaten away. Corrosive cleaners that contain high levels of phosphates and pine oils, as well as ammonia and vinegar, cleaning products are not recommended as they can damage the floors. It’s also important to keep moisture off of concrete floors because water can seep into concrete and expand the material, potentially leading to cracks. In addition, mold and mildew can form in concrete that has absorbed water. Finally, treated concrete floors should have a protective seal applied at least once a year, depending on the level of foot traffic. 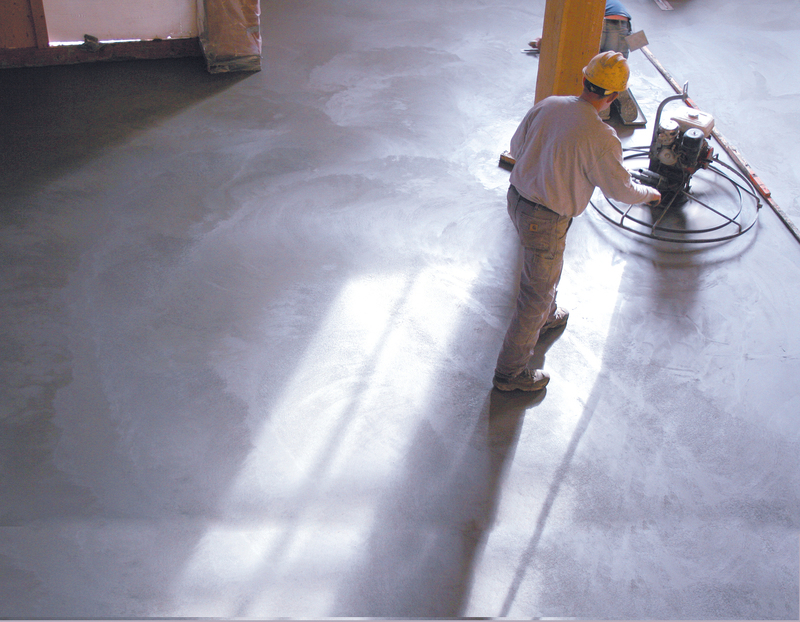 To maintain beautiful concrete floors, the seal should be applied every 3-9 months in heavily travelled areas. Our specialists can provide the maintenance required to keep your stained concrete floors looking like new. With these easy and cost efficient steps, you can keep your decorative concrete in premium condition. While there are clear benefits to stained concrete floors, there are negative aspects as well. To be sure that this is the flooring option for your business, consider the following potential problems. Installing stained concrete floors can be a hassle due to a relatively long lead time and the mess associated with the installation. It can take days for the concrete to be poured and set, so consider a time when you can keep the project area free of foot traffic. Adding color to concrete floors will also add time required for installation. If the pigment is added to liquid concrete, locating and mixing it in can be time consuming. If an acid stain or paint is applied, it can take several days for the process to be completed. Also, any time the floor needs to be resealed, downtime will be required for it to dry. Another drawback of stained concrete floors is that they are not particularly comfortable. While this is rarely a problem for businesses, if your customers are standing for any length of time, they might become uncomfortable due to concrete’s inflexible nature. Concrete also does not retain heat. This can impact the temperature of your location, and should be considered when deciding on new flooring. While the maintenance of concrete floors is fairly easy, it is time consuming. To ensure that your concrete looks like new, it might have to be polished every few years. This means that the surface of the floor needs to be lightly ground and then polished to reveal floors that look as great as the day they were installed. Polishing is best left to professionals, who know which materials and techniques to use to get the best results. If you think stained concrete floors are right for your business, Concrete Restoration Services can help! We have been experts in commercial concrete in Maryland, DC, and Virginia for over 30 years, and can offer your business the concrete flooring you want. Call 301-261-4933 for a FREE estimate, or click the button below to contact us.